It’s strange that the first book about Byetta is for children. Strange, because the Food and Drug Administration hasn’t approved this new diabetes drug for children yet. In the year since the FDA approved Byetta many people — myself included — are using it with great success to control their blood glucose levels and not incidentally to lose a lot of weight. I certainly expect that the manufacturer, Amylin Pharmaceutics, will be testing it for children with type 2 diabetes, if the company isn’t already. And I’m sure that doctors are already prescribing it to some children as an acceptable “off-label” use. If you are interested in Byetta even if you are an adult, this lovely new book by Toney Allman will certainly interest you. It is really easy to read and completely accurate. This book is especially valuable because it is beautifully illustrated. 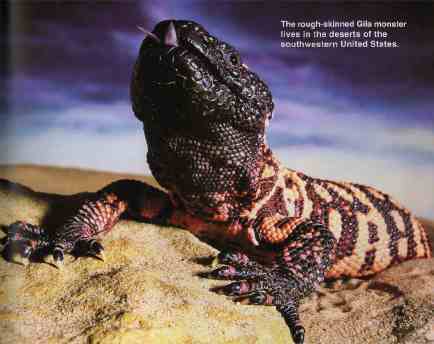 For example, this is the most beautiful picture (below) I have ever seen of the ugly Gila monster, which is where the drug that became Byetta came from. And the picture of the man on the cover is the first picture that I have ever seen of my hero. He is Dr. John Eng, who discovered Byetta. I interviewed him more than four years ago for what I think is the first article ever about Byetta, The Monster Drug. This book is part of the wonderful “Imitating Nature” series, which now includes eight other books, all written by Toney Allman. I know that it’s a wonderful series, because the publisher initially sent me the wrong book in the series, From Gecko Feet to Sticky Tape. It wasn’t what I was looking for — and I am not a child any more — but I enjoyed it just the same. From Lizard Saliva to Diabetes Drugs is a short book that is indeed “illustrated nonfiction for students in elementary and middle schools,” which is the type of book that KidHaven Press publishes. Unfortunately, the publisher’s website is not up-to-date and includes only two of the books in the Imitating Nature series. 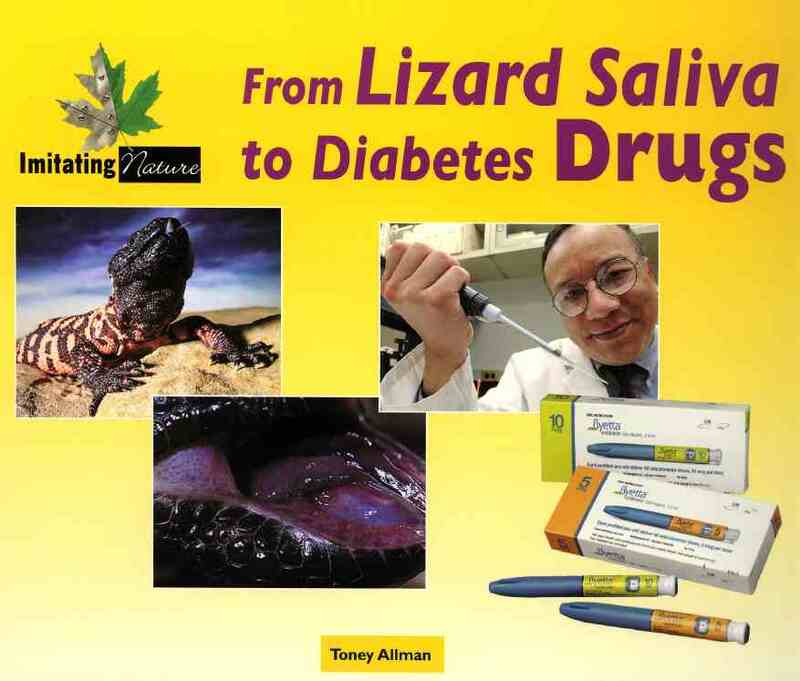 Amazon.com, however, lists and offers From Lizard Saliva to Diabetes Drugs in the hardcover edition. Published on April 30, 2006, this little 32-page book lists for $22.45. The ISBN is 0737734876. David Mendosa is a freelance journalist and consultant specializing in diabetes and lives in Boulder, Colorado. When he was diagnosed with type 2 diabetes in February 1994, he began to write entirely about that condition. His articles and columns have appeared in many of the major diabetes magazines and websites. His own website, David Mendosa’s Diabetes Directory, established in 1995, was one of the first and is now one of the largest with that focus. Every month he also publishes an online newsletter called “Diabetes Update.” Twice weekly he writes for his blog at http://blogs.healthcentral.com/diabetes/david-mendosa. He is a co-author of What Makes My Blood Glucose Go Up...And Down? (New York: Marlowe & Co., August 2003).